The world economic outlook has worsened over the past three months and growth will stay flat this year, the International Monetary Fund said Tuesday as it downgraded forecasts for most countries except Japan. The IMF said the world economy should grow by 3.3% in 2013, down from a January forecast of 3.5%, leaving the pace of growth little changed from 2012. Growth should then pick up to 4% in 2014, it added. 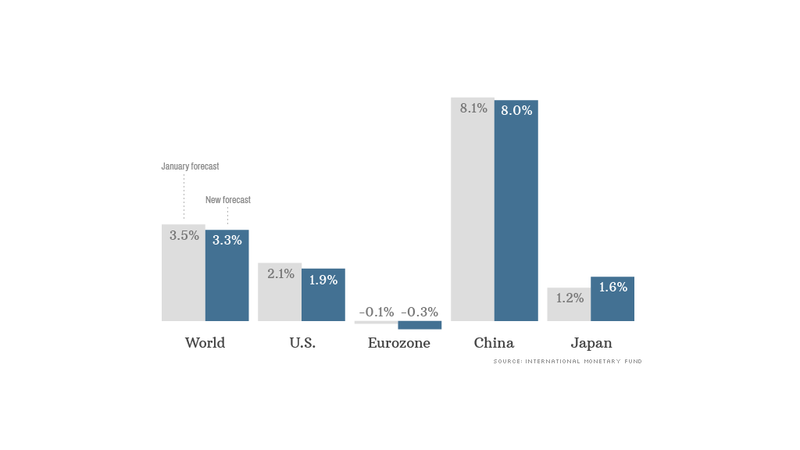 Government spending cuts prompted IMF forecasters to cut their outlook for the United States, but even with growth slowing to 1.9%, it will still outperform all other major developed economies. Eurozone output will fall by 0.3%. And Japan should see growth of 1.6% -- the only significant upgrade from January among developed nations. Policymakers had averted the threat of an even greater fiscal contraction in the United States and a breakup of the euro. But the eurozone remained the biggest source of risk for the global economy, followed by high levels of debt in the United States and Japan, the IMF said. A messy bailout of Cyprus last month revived fears about the ability of eurozone institutions to manage the region's debt crisis. And backlashes against austerity in Italy and Portugal show that governments are finding it harder to introduce reforms. "Recent good news about the United States has come with renewed worries about the euro area," noted IMF chief economist Olivier Blanchard. "Given the strong interconnections between countries, an uneven recovery is also a dangerous one." The new Japanese government led by Shinzo Abe has pursued an aggressive policy of monetary and fiscal stimulus to counter deflation in a bid to end decades of economic stagnation. "Japan is forging a path of its own," Blanchard added. "This policy will boost growth in the short term." The IMF shaved its forecast for China to 8%, stronger than the rate seen at the start of the year. Growth in the first quarter fell to 7.7% from 7.9% in the final quarter of 2012, surprising investors and sending global markets lower Monday.